Hofgrir Horse-Crusher is a Nord warrior and the owner of Riften Stables, which he runs with his assistant Shadr. He gained his name following an incident in his youth, during which he got drunk and managed to break a young horse's back after trying to mount it. He hasn't ridden since. Hofgrir's schedule sees him wander around Riften Stables. He will perform random tasks such as eating, sleeping, walking, waiting, and sitting however he sees fit due to a bug. 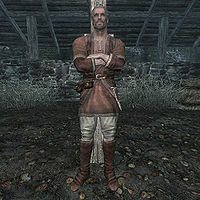 Hofgrir wears a set of merchant clothes and a pair of boots. He is equipped with a leveled dagger which can be up to elven quality. He carries a key to the stables, and a selection of common loot and gold. 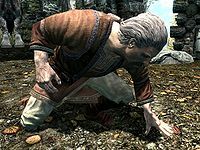 Hofgrir will greet prospective customers by either claiming he is busy and any business must be done with haste: "Got horses that need shoeing, so make it quick." Or that they are at the right place if they are looking for a mount: "Too lazy to walk, eh? Well, you've found the right place." He can be asked about his odd name, which will earn an explanation of it: "Been stuck with the name for years. I've been ridin' horses since I was a lad... nothin' I liked more. But as I got bigger, so did my mounts. Then one day, I was drunker than I've ever been and mounted a poor colt. Broke his back in two. Haven't ridden since." Asking Hofgrir if he is willing to sell you a horse when he has one available will have him reply: "Don't mind if you do. What's your price?" Offering him 1000 gold for the horse while you have that number of coins will have him agree to the offer, and point you towards your new steed: "Sold. She's all yours. She's already saddled up." If you have insufficient funds but try to make the offer anyway, he will tell you to return with the correct amount of coin: "That would work, except you ain't got." If you instead change your mind after asking him about acquiring a horse, he will reply by saying he should have known better than to deal with you: "Should have known you'd be a cheap one." Attempting to purchase a horse when he does not have one for sale will have him tell you that he cannot do business without any horses available: "If I had one you could. They're all spoken for." Mentioning the dangers of living outside the town walls will have him reply by saying that he does not worry about it due to his natural strength: "Bah, I'm not afraid of anything out here. Walls are just a weakling's hiding spot. Now me, I'm no weakling. In fact, I bet I've got the strongest arms in all of Skyrim." If his claim of being the best fighter out there is challenged, he will reply by literally betting that he is stronger: "Oh! Sounds like I've got a challenger. Tell you what. How about a friendly wager, just between us. I bet you my entire purse of septims I can beat you in a fistfight. You match the bet and we fight until one of us gives in." If the bet is matched he will attack after saying: "All right, remember... this is a clean fight. No weapons, no tricks. And none of those fancy magic spells, either. Here we go!" If the necessary funds aren't available, he will instead say: "Well come back when you earn some more so I can take it from you!" Backing out of the contest by suggesting another time will have him reply: "I don't blame you. If I were in your shoes, I'd chicken out too. Well, offer still stands if you ever want to have a go." If you back out of the bet the first time, he may greet you by saying: "Back, eh? Ready to brawl?" Hofgrir Horse-Crusher is in possession of a Mark of Dibella that he acquired from Haelga. During the quest Caught Red Handed, Svana Far-Shield will ask that you obtain them to embarrass Haelga. If you ask him to give you the mark, he will pretend to be innocent: "Huh? What are you talking about? I don't even know what that is." You can persuade him to give the mark to you, as long as you have a Speech skill level of more than 25. Hand it over and no one has to know. (Persuade) Passed: I don't want a bad reputation in Riften, but Haelga's out of control. She wanted to try it in the stables so I said yes. If you want the mark that badly then go ahead and take it. Give it to me or else! (Intimidate) Passed: I don't want a bad reputation in Riften, but Haelga's out of control. She wanted to try it in the stables so I said yes. If you want the mark that badly then go ahead and take it. Hofgrir's assistant, Shadr, will frequently speak well of him: "Hofgrir is a great teacher. I've learned so much about horses from him." He will also direct you to speak to Hofgrir regularly: "If it's horses you want, you'll want to speak to Hofgrir at the stables. ", or if you started the quest Stabilized but have yet to talk to Sapphire: "If it's horses you want, you'll want to speak to Hofgrir. I'm afraid I'm in too much trouble to help you." Asking him about his work at the stables will have him talk about how Hofgrir Horse-Crusher is helping him: "Yes. Hofgrir took me in when I arrived in Riften about a year ago. He's been teaching me everything he knows. Horses are my whole life. Back in Hammerfell, I helped my family raise horses at our farm. I hope to open my own stables one day, but I think it's going to take a lot longer than I expected." Bloody Nose: Defeat Hofgrir Horse-Crusher in a brawl. If you brawl against him and win, you will get to ride his horses for free. His schedule was supposed to be more concrete, having him work outside between 8am and 8pm and sleep for the remaining hours, but a misplaced package overrides those two. If you accept to brawl him, but don't have the 200 gold to match him, the quest will break. Asking for a rematch makes him imply that you don't have enough gold to cover the bet regardless of what amount you are carrying. The quest can also break even if you have enough gold, causing you to enter "brawling" mode (unarmed and fists up), but he just walks away. Attacking is considered a crime and will earn you a bounty. Asking for a rematch returns the same issue as above. When you enter a brawl with him before entering Riften for the first time, Hofgrir may pull out a weapon at the end of the fight and attack. If that happens, you may kill him without incurring any bounty. Esta página foi modificada pela última vez à(s) 12h17min de 28 de outubro de 2014.